Do you dream of being a mangaka, or simply wondered how manga are made? Then this is the series for you. This manga captures the life of 2 young aspirants to mangakas in a way that you feel all the surprises, thriller and drama in a very funny way. It's not easy to become and live as a mangaka, as Mashiro knows from his late uncle. Bakuman is increasingly interesting and worth reading. It has a beautifully crafted story with a unique art style, a real manga full of spirit and emotions. And is written by Tsugumi Ohba and illustrated by Takeshi Obata the same duo who gave us Death Note. Another interesting aspect of the manga is the insertion of story ideas of the mangas that the artists make, some concepts in the creation of stories and how to make an interesting manga in general, plus a few insights on how the manga industry works. 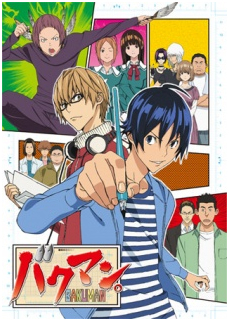 If you like seeing how comics are made, or if you have a dream of your own, read Bakuman! It’s a terrific series, and a nice inspiration.